The selector lever is equipped with a selector lever lock. When changing the selector lever position from P to a driving gear, depress the brake pedal and push the lock button in the selector lever in the direction of the arrow or . To move the selector lever out of position N to position D or R, first depress and hold the brake pedal. The current selector lever position will be shown in the instrument cluster display if the ignition is switched on. Parking lock The drive wheels are locked mechanically. May only be selected when the vehicle is stationary. To disengage this selector lever position, depress the brake pedal and also switch on the ignition. Reverse gear The reverse gear is selected. May only be selected when the vehicle is stationary. Neutral The gearbox is in the neutral position. No power is being transmitted to the wheels and the braking power of the engine cannot be used. Standard driving position (normal programme) All forward gears are shifted up and down automatically. 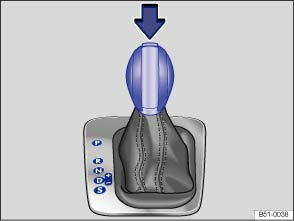 The timing of the gear shift is determined by the engine load, your individual driving style and the speed of the vehicle. Standard driving position (sport programme) All forward gears are automatically changed up and down at higher engine speeds than in selector lever position D. This uses the full power available from the engine. The timing of the gear shift is determined by the engine load, your individual driving style and the speed of the vehicle. The selector lever lock in position P or N prevents gears from being engaged inadvertently, which would cause the vehicle to move. To release the selector lever lock with the ignition switched on, depress and hold the brake pedal. Press the lock button in the selector lever at the same time. The selector lever lock is not engaged if the selector lever is moved quickly through position N (e.g. when shifting from R to D). This makes it possible, for instance, to rock the vehicle backwards and forwards if it is stuck in snow or mud. The selector lever lock engages automatically if the brake pedal is not depressed and the lever is in position N for more than about 1 second and the vehicle is travelling no faster than approximately 5 km/h (3 mph). 6-speed gearbox: depress the foot brake and then release it again. 7-speed gearbox: move selector lever to position P or N and then select a driving gear. Selecting an incorrect selector lever position could cause you to lose control of the vehicle, potentially leading to an accident and serious injuries. Never depress the accelerator pedal when selecting a gear. When the engine is running, the vehicle starts moving as soon as a gear is engaged and the clutch pedal is released. Never select the reverse gear or the parking lock while the vehicle is in motion. 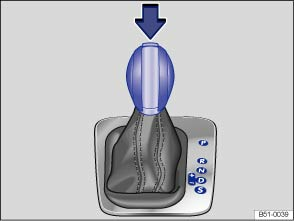 The driver may never leave the driver seat if the engine is running and a gear has been selected. If you have to leave the vehicle while the engine is running, always apply the handbrake and move the selector lever to position P.
If the engine is running and the selector lever is in position D, S or R, the vehicle must be held with the foot brake. The vehicle will creep forward as the power transmission is not fully interrupted even when the engine is idling. Never select the gears R or P when the vehicle is in motion. Never leave the vehicle with the position N selected. The vehicle will roll downhill irrespective of whether the engine is running or not. If the handbrake is not applied when the vehicle is stationary and the brake pedal is released when then selector lever is in position P, the vehicle may move a few centimetres forwards or backwards. If the lever is moved accidentally to N when driving, take your foot off the accelerator. Wait for the engine revs in the neutral position before selecting a driving gear again.